This sorting carriage handstamp on a 1887 Jubilee ½d Vermillion - SG197 - is probably one of the only known examples of what Harold Wilson describes as W411 in his book, and is not valued by Frank Wilson in his. 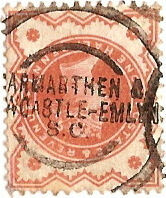 The Carmarthen and Newcastle Emlyn Sorting Carriage commenced about the 14th December 1875, and initially ran to Llandyssil; handstamps were not issued until 6th January 1877. 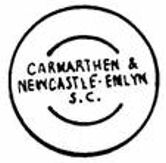 The SC was extended to Newcastle Emlyn in July 1895 and ended operation on 1st May 1904, a period of only nine years. Hampstamp W411 was issued to the SC on 28th August 1895 and until now (March 2010) has not been seen or recorded used. Since this was acquired on eBay for the paltry sum of £7.50 plus p+p the new owner must be a very happy collector to have what is probably one of the only examples of this rare handstamp.